Vic Williamson with engineering firm K2M Design of Columbus, Ohio, right, pencils in proposed changes in the preliminary plans for the Jail Prisoner Intake Addition to be constructed at the Shelby County Jail this summer. The new addition will insure the safety of the jail’s staff and occupants in the event of airborne contamination from drugs like Fentanyl. Williamson met with Shelby County Commissioners and members of the Sheriff’s Office on Thursday to discuss those changes. SIDNEY — The Shelby County Commissioners, members of the Shelby County Sheriff’s Office and jail facility met Thursday to discuss modifications in the preliminary design stage of the Jail Prisoner Intake Addition to be built later this summer at the Shelby County Jail facility. Vic Williamson, senior project manager with engineering firm, K2M Design of Columbus was on hand to answer any questions and consider proposed changes suggested in the plans as currently intended. The new intake addition will insure the safety of those working in and occupying the facility, and the building as a whole in the event incoming prisoners are contaminated by exposure to toxic drugs like Fentanyl or Carfentanil which can be deadly if breathed or contracted by touch. Planning for the project has been a work in progress and is nearing completion as most of the required designing criteria has been met. County officials became concerned about the intake of prisoners at the jail after an incident in Darke County prompted the evacuation and shut-down of that county jail due to exposure of fentanyl while processing a prisoner into that facility; two police officers were sickened and hospitalized after coming in contact with the drug which also entered the jails heating and air conditioning system during the incident. Shelby County Commissioner Bob Guillozet noted the Darke County Jail remained closed for three months while a specialized contractor disinfected the whole facility including the interior of the HVAC ventilation system. After his initial greeting, Williamson asked those in attendance who are associated with the planning if they had any concerns or questions and or any proposed changes that might be warranted. Among those in attendance were Jail Facility Manager Greg Lyons and three members of the Shelby County Sheriff’s Office including Chief Deputy James Frey, Sgt. Karla Pleiman and Lt. Cori Steiner. Other than the placement of some of the fixtures like tables and benches in the intake room, area no other issues were noted. Williamson said the plans would next be presented to the State Bureau of Adult Retention for their inspection and approval. Guillozet asked if there was a prospect of any holdup as they were anxious to get the construction underway. “It’s not likely at this point,” said Williamson noting the plans made provisions for all the codes and requirements normally associated with a project of this kind. Williamson also mentioned the small changes in plans would have no effect on the current cost estimate of slightly over $800,000 or the construction timeline. “We always have contingencies built into our estimates to cover unforeseen additional costs, so if anything there is a possibility the cost projected will be less than anticipated. True, compared to a normal construction project the cost is much higher but that is due to all the specialized State and Federal codes and different layers of safety requirements built into the plans to insure the safety and security of all those involved in the intake process,” said Williamson. “We are talking retention here, not your typical building which is a totally different animal in its planning and construction; true the cost is higher for a retention facility but there are a lot more safety issues than normal, we are just making sure all the bases are covered for the sake of all concerned. 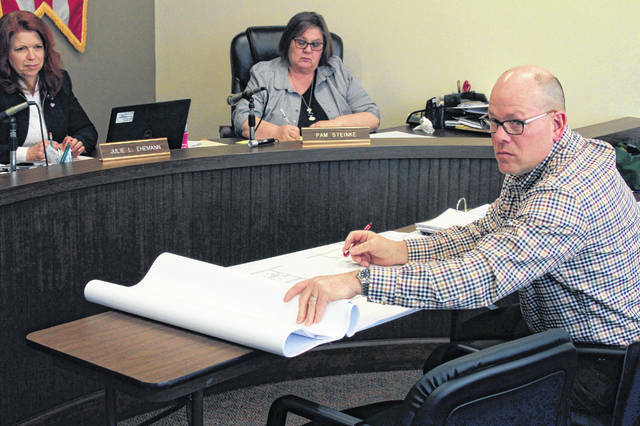 Unless there is an unforeseen setback, we will advertise for bids in early June and construction of the intake addition could begin as soon as mid-July,” Williamson said. After a brief discussion all the commissioners voiced their approval and justification associated with the new facility. Commissioner Tony Bornhorst shared his sentiments. “As Bob noted earlier, safety is our main concern, we do not want anyone getting hurt or injured due to a faulty system, that’s why we put in a body scanner two years ago, and it’s all a part of the big picture. There’s also the revenue security, we expect about $1.2 million in revenue this year from the Sheriff’s Department, keeping our facility open and operation is a major concern not just for the county but for those living in and around our community as well. Commissioner Julie Ehemann shared her approval and thanked those in attendance for coming and sharing their concerns and support. “This is not just something we want, it’s something we need to insure the safety of our law-enforcement officers, the staff at the jail, and the prisoners as well,” Ehemann said. Greg Lyons, facility manager at the Shelby County Jail also welcomes the proposed new addition as well.